Rent a Wi-Fi router today and get connected anywhere, anytime in Singapore. *Enjoy up to 3GB of local data for each day of the rental period. *The data usage will reset daily at 00:00 hours. How To Rent The Device? Fill in the reservation form online with your contact details and the rental dates. Reservation to be at least 3 days (72 hours) prior to your departure date of your travel. A confirmation email together with the reservation form will be sent to your email (within 1 working day). Print out the reservation form. Email us at wifi@changirecommends.com.sg if you did not receive our email. 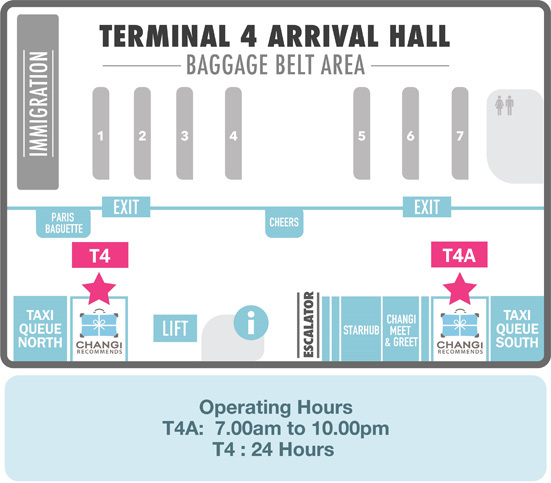 Pick up at the respective Changi Recommends booth indicated on the reservation form. Refer to the map above for the locations as well as operating hours. Produce your passport and reservation form to collect the Wi-Fi device. Deposit of $200 in the form of authorization hold of credit card is required. The SGD200 authorization hold on a credit card is the holding of this amount unavailable on your credit line. No actual charge is made on your credit card by Changi Recommends. The authorization hold is released from your account (rendering the balance available again) from 14 working days, after the transaction date depending on cardholder’s issuing bank. In the case of some credit cards, holds may last as long as 30 days. Payment will only be collected upon the return of the Wi-Fi router. Wi-Fi router will be released if the collection is not made on the date indicated on the reservation form. 1. 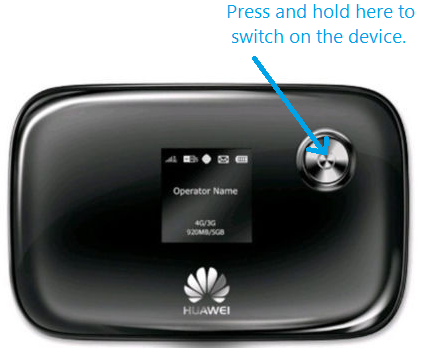 Turning on the Mobile Wi-Fi: Press and hold the button until the screen lights up. This indicates that the Mobile Wi-Fi is turned on. 2. Proceed to Settings on your mobile device and ensure that your Wi-Fi function is on. 3. Search for the network that matched the mobile Wi-Fi SSID and enter the Wi-Fi key. Wi-Fi SSID and key are indicated at the back of the Wi-Fi router. 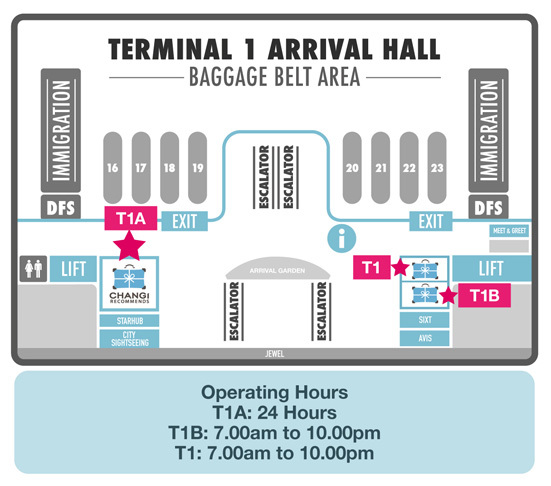 Return at the respective Changi Recommends booth indicated on the reservation form. 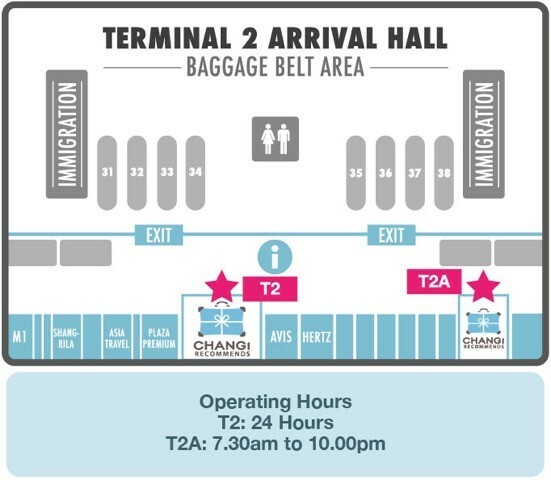 Note that return can only be made at Arrival Hall. Payment to be made upon return of the Wi-Fi router. Billing starts on the day the Wi-Fi router is collected and ends on the day of return. Rental charges will be based on full days (Not fractional days). For example, if the device is collected on 1st Aug and returned to Changi Recommends counter on 5th August, you will be charged 5 days rental. 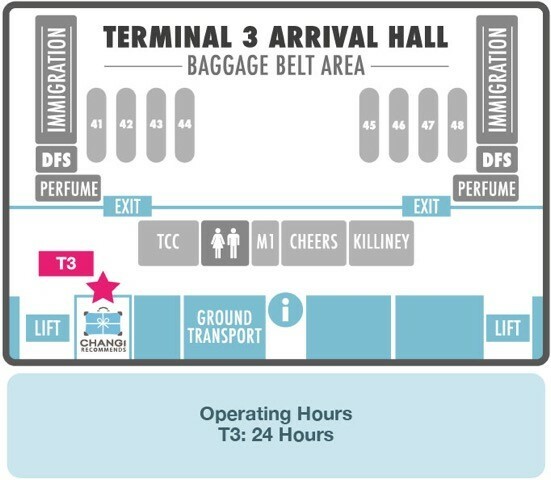 You can find us at the respective Changi Recommends booth indicated below. Refer to the map below for the locations as well as operating hours.